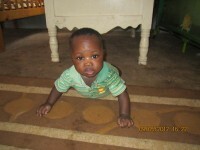 This is an image of little Tidiane from the Orphelinat Niaber. Tidiane is a serious little toddler. We noticed he often played alone and wondered why. We soon realized the problem when we noticed him dragging himself over to us. When I picked him up I realized his thin legs lacked muscle tone. I played with him and gave him physical therapy. He loves being held. The physical therapy is ongoing and we are trying to secure braces for him.